What Are the Best MHA Programs of 2018? What Can I Learn in an Online Healthcare Management & Administration Master’s Program? What Can I do with a Master’s in Healthcare Management & Administration? How Much Can I Make with a Career in Healthcare Management & Administration? The job outlook for the healthcare administration field remains positive as the growing population of elderly individuals, or baby boomers, stay active, live longer and seek medical services to stay in the best shape possible long term. If you want to gain a competitive advantage in the field, you might benefit from earning an online master’s degree in healthcare management and administration. Find out what you can expect to learn in these types of degree programs, what careers they can lead to and the top-ranking online master’s programs for aspiring healthcare administrators. The best online MPH programs incorporate both practical application and theoretical learning to prepare students to manage private health organizations, government agencies and nonprofit organizations. Take a peek at our rankings list below to find out which colleges and universities offer the best online MHA degree programs. For these rankings, we obtained our data from the United States Department of Education, the Integrated Postsecondary Education Data System (IPEDs) and the universities’ own published materials. All of the schools in our list are accredited. Drawing from its Catholic roots, Rosemont College offers a holistic education, emphasizing mind and spirit in all its academic programs. Its online Master of Science in health care administration provides a flexible path for professionals seeking leadership and management positions in public, private, and nonprofit health care agencies. The MS curriculum blends practical knowledge necessary for health care administration with ethical instruction, drawing inspiration from Catholic teachings. Courses are offered in accelerated, flexible 7-week terms, which students can complete on their own schedule, even while working full time. Students will learn information technology, risk management and community assessment skills through a broad range of courses. On top of academic and spiritual instruction, Rosemont also places an emphasis on leadership with all its online degrees. Students should be prepared to take courses related to ethics and leadership in order to graduate. In total, students will need to earn 33 credits, 3 of which will be from a capstone project. Depending on how many courses students take each term, Rosemont estimates that it should take 18-24 months to earn the degree. All of the courses offered for this program are available entirely online, and all students will pay the same flat tuition rate of $655 per credit. To apply, applicants must submit transcripts from their 4-year undergraduate degree and a statement of purpose regarding how they expect the degree to further their career along with their application. This program is suitable for students who already have a degree related to healthcare and have some relevant work experience or are currently employed in a related field. Independence University's Master of Science in health care administration degree is only offered online. The program is career-focused, prioritizing the skills and education you will need to be a successful health care administrator and electives that provide the knowledge to help advance your career. Graduates are qualified to go on to work as health care administrators, policy analysts and human resources managers in a health care agency, to name just a few potential career options. The curriculum covers both health care and business topics, including courses on health care marketing, policy, finance and information systems. Studying full time, Independence estimates that it will take students15-20 months to earn their master's degree. There are multiple start dates throughout the year, so students can begin their studies whenever they're ready. The master's in health care administration is meant for all students, so no previous health care experience is required. To graduate, students have to complete 57.5 credit hours. Many of the courses offered by Independence are worth 4 credits instead of the usual 3, so the high credit count doesn't necessarily mean a longer program. All online graduate students will be charged the same flat tuition rate of $506 per credit. The university also offers a grants and scholarships through its Good Neighbor Initiative. These awards are not dependent on previous grades, but require a separate application, references and an essay on how earning a degree will change your life. Graduate success is a priority for Concordia University â€“ Saint Paul, and 95% of its graduates are employed within a year of earning their degree. Students who pursue a degree in a high-demand field, such as the Master of Business Administration in health care management, often have strong career potential. The program looks at how business principles impact health care industry trends. Concordia's MBA in health care management requires 42 credit hours to graduate. Most courses will last 7 weeks and there are 6 sessions throughout the year, so students can accelerate or pace their education in whatever way works best for them. While all of the courses for the program are offered entirely online, some courses can be studied on-campus and others can blend on-campus and online studies. The time it takes to complete this program depends on how many courses the student takes each term, but most students will earn their MBA is less than 2 years. To apply, students must submit an application, an undergraduate transcript showing an average of 3.0 GPA or better, a personal statement and a resume. All students in this program will pay the same tuition rate per credit. A unique aspect of the MBA program at CSP is the Mentor and Managerial Application Portfolio (MAP) program. This pairs each graduate student with a faculty member who will serve as a mentor throughout the student's education. Along with guiding the student toward their degree, the mentor will also help students make professional connections, offer advice on how to polish their resumes and help them prepare for interviews. Belhaven University is a small, Christian school that has a growing online curriculum that accounts for nearly half its academic programs. The online Master of Health Administration combines academic and technical topics with teachings of Christian values. The goal of the program is to prepare students for a career in health care administration, so coursework covers areas like health care ethics, the health care legal and regulatory framework, health care quality management, and health care finance. All of the courses are offered entirely online, in 8-week formats, and most students complete the MHA in just 2 years. While most of the courses are flexible and allow students to study whenever they want, some courses will have project team activities. These are required and will have students work with each other at a set time, gaining experience and preparing them for a real-life position. In total, students will need to complete 12 3-credit courses, including a capstone project, to earn their degree. Students don't need any previous experience in the field prior to applying. Applicants must have a 2.8 cumulative GPA from their undergraduate degree or 9 hours of graduate work with a B in each class. Motivated students who don't meet that standard can submit an essay and two letters of recommendation and may be admitted on a conditional basis. All students in the MHA program are eligible to join the Belhaven chapter of the American College of Healthcare Executives (ACHE), which provides ongoing educational and networking opportunities with health care executives. Through New England College's online school, students interested in healthcare administration can earn a Masters of Science in Management with a specialization in health care administration health care administration. The curriculum requires completion of 12 courses. Five core courses cover general management topics including organizational leadership, strategic planning and professional ethics. The remaining 7 courses cover topics like marketing, finance, and legal issues as they relate to the health care industry. In total, these courses add up to 34 credits. A strategic capstone project is part of the core coursework required. The program is designed for students who already have some business and health care knowledge or professional experience. However, there is no previous experience required, and students will have learned everything they need for a career in health care upon earning their graduate degree. Graduates will be prepared for a wide range of health care careers, including hospital administrators, directors of long term care facilities, or managers in biotech firms. The school offers rolling admission every seven weeks. No GMAT or GRE tests are required for admission. Once students enroll in the program, they'll be included in a cohort. This is a group of up to 15 other students that they will take every class with, helping them build teamwork skills while working toward a common goal. Courses are laid out ahead of time, so students will be able to look at what will need to be completed down the road. The small class sizes of this cohort system allow students to get personalized attention from their professors. Anderson University is a small Christian university offering an online Master of Business Administration with a concentration in health care leadership. Courses are available entirely online, although students can combine online courses with evening, on-campus courses if they choose. Because it was designed for working students, this program is also accelerated with courses lasting 6 weeks and start dates throughout the year. Typically online students take one class at a time. Working students can complete their MBA in as little as 18 months. There are 2 parts to earning this degree. First, students will need to complete 12 required core courses (36 credit hours) for the Master of Business Administration. These are typical MBA courses, covering business topics like financial management, leadership ethics, marketing and human resources. In addition to the core courses, students earning a health care leadership concentration then take 3 courses (9 credit hours) focused on key areas of health care administration: healthcare structure and policy, health care finance and economics and health care quality, safety and outcomes. In total, students will need to complete a minimum of 45 credits in order to earn the MBA degree with the health care concentration. While no previous work experience is required for the MBA in health care leadership, students are expected to have a bachelor's degree, preferably in business. Those who do not have a bachelor's degree in business may need to take 4 foundational business courses at the start of their MBA program. Potential internship opportunities are provided for students that aren't working while earning their degree. As the 9th oldest public school in the nation with over 200,000 alumni, Ohio University offers 21 different online master's degrees, including a Master of Health Administration (MHA). The MHA is an entirely online degree program that is meant to provide students with a broad foundation in health care leadership to prepare them for executive positions in the health care industry. Ohio's large alumni network can be useful in making connections and finding work after earning a degree. The curriculum assumes that students have some business and/or health care experience, although neither is required for admission. Each course in the program is 7 weeks long, and students need to take 12 courses in order to earn the required 36 credits to graduate. Students can start in Fall, Spring or Summer. The curriculum covers the key knowledge and skills health care executives need, including quality assurance, ethics, legal issues, finance, marketing and policy. The program is designed for busy professionals, so students typically take one course per term and thus can complete their degree in 2 years. Students taking more than one course per term can complete their degree in even less time. Ohio residents get a small discount on tuition, paying $654 instead of $673 per credit unit. Applicants to the MHA program should have a cumulative undergraduate GPA of at least 3.0 in any discipline and at least 2 years of recent professional health care experience. Transfer credits are not allowed. Students should also have a foundation in statistics and financial accounting. If not, they can take those courses upon admission before beginning their other coursework. Mississippi College is a private, Christian college and the oldest college in the state of Mississippi. Designed for working professionals, Mississippi College's online programs serve students across 39 states and 20 countries. 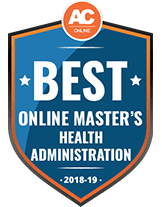 Its Master of Health Services Administration is available entirely online, although students can also choose to complete some of their studies on Mississippi College's campus. Students learn the same material online as they do in-person. Graduation requires completion of 30 semester hours of coursework, including 24 semester hours of required core work and 6 semester hours of electives. The coursework is meant to give students a strong all-around understanding of the field. Courses will cover financial management and marketing, research methods, legal issues, and ethics in an effort to give future health care administrators a solid foundation for leading successful organizations. Students should have an undergraduate degree in one of the health sciences or have at least one year of professional experience in the health care field. While most courses follow the traditional semester format, students can choose to accelerate their degree, breaking each section into 8-week terms. This allows students to complete their degree in less time, although it is more rigorous and is not recommended for students who have professional obligations outside the classroom. Tuition is the same for all online students, regardless of where they live. Tuition can be further reduced through scholarships, which many online students at MC earn every year. Applicants should submit undergraduate transcripts and standardized test scores along with their application. Park University was established in 1875 and today has more than 16,000 students studying online and at 41 different campus centers. The university gives its Master of Health Care Administration students plenty of options to specialize their education. Students can choose a general MHA or they can pick from one of 9 different concentrations â€“ including such diverse subjects as disaster management, homeland security, global business and information systems â€“ based on their career interests. Regardless of which concentration students choose Park requires 36 credit hours to graduate. Generally core courses account for 12 credits, and the remaining 24 credits are electives in your chosen area of concentration. Because of the diverse range of concentrations at Park, graduates can go on to careers in international business, government agencies in charge of emergency response, or traditional health care organizations. Courses are offered in the traditional semester format, and Park assumes that students are often working professionals with limited time. Some courses are offered in a hybrid format, allowing students to combine online coursework with some in-person instruction at one of their participating campus centers where they get an opportunity to collaborate with fellow students and apply what they have learned. Because Park is a small, private school, they are able to offer low student-to-faculty ratios, giving students a more personalized education. Online students get access to many of the same resources as on-campus students, but pay a reduced tuition rate per credit. Midwestern State University, Texas offers a Master of Health Administration degree to working professionals interested in leadership positions in the health care industry. The program can be completed entirely online, or through a hybrid of online and on-campus learning. Students interested in the hybrid program can enroll in seminars on campus. To earn the degree, students will need to complete 45 semester hours spread over 15 courses with a grade of B or higher in each class, making it longer than many other MHA programs. Students must also pass a comprehensive exam prior to graduation. While earning their master's degree, students must pick from one of 4 concentrations: Health Information Management, Medical Practice Management, Public and Community Sector Health Care Management or Rural and Urban Hospital Management. Once they have chosen a concentration, students will work with a Graduate Coordinator to set up a degree plan. Students will need to complete 33 semester hours of core courses, along with 12 semester hours of elective courses for their specialization. MSU offers out-of-state online students a discounted tuition rate. Part-time students can complete this program in 2-3 years, and those studying full-time can complete the program in 5 semesters. To apply, students should have a minimum GPA of 3.0 from an accredited undergraduate program and must submit GRE test scores. If their undergraduate degree did not include clinical training, applicants should have some work experience (paid or voluntary) in a health care field. MSU encourages students to begin their studies in the fall, but allows some students to start in the spring or summer. Tiffin University is a small, private school that has a growing graduate degree program. Because many graduate students are busy and can't commute to campus, Tiffin offers many of these programs online. The Master of Business Administration in health care administration is one such program, available entirely online or through a hybrid of online and on-campus learning. Intended for working students, the MBA in health care administration is accelerated, making it easier for students to earn their degree while continuing to work. Courses are offered in 7-week terms with a total of 6 terms occurring throughout the year. There are start dates before every term. A total of 32-36 credits are required to earn the degree, depending on the student's background. Each student should consult with Tiffin prior to applying to find out how many credits they'll need to graduate. In addition to typical MBA coursework, the curriculum focuses on new technology, financial management, referral systems and other legal and ethical issues in health care. This program assumes that students are currently working in a field related to education, health care, child care, business or social services, although employment is not required for entry to the program. Non-working students who study full-time can complete this degree in as little as 14 months, while part-time students generally complete the degree in roughly 2 years. The online tuition at Tiffin has remained the same for the past 5 years and is a flat rate per credit hour. Tiffin also accepts transfer credits to its master's program, which could reduce the time and cost of earning the MBA in health care administration. The Gillings School of Public Health at the University of North Carolina at Chapel Hill prides itself on being the "top public school of public health" in the country. Its Master of Health Care Administration is a hybrid program offering classes online, but also requiring students to visit campus several times throughout their education. To earn their MHA, students will need to complete 49 credit hours, and students typically complete all their studies in 2 years. This timeline assumes that students are studying full time and throughout the year, including during the summer session. The on-campus visits required for the program occur in the fall, spring and summer terms, lasting 6 days in the fall and 4 in both the spring and summer. Students start their studies during the fall term. While all the required courses are available online, students can also choose to supplement their education with an internship, which counts for credit toward the master's degree. UNC's Master of Health Care Administration program is one of the more competitive programs in the nation. The university is deeply engaged in researching and solving public health problems around the country and the world, providing graduates with numerous opportunities for engagement. Only 30-35 students are admitted into the program each year. Students will need managerial experience and an understanding of finance and accounting to be accepted into the program. Applications are due in May for the fall term, and students must submit GRE/GMAT test scores and three letters of reference along with their application. Boasting a low student to faculty ratio, Western Carolina University is perhaps best known for its undergraduate programs. However, through its online school, WCU has been expanding its graduate program offerings. The Master of Health Sciences is a fully online degree program designed for health care professionals interested in leadership positions in the field. Students specialize in 1 of 3 concentrations: Emergency Medical Care, Health Education and Health Management. Students interested in health care administration would most likely concentrate in health management, but all 3 concentrations will expose students to areas of health care administration. To graduate, students are required to complete a total of 33 credit hours in a combination of core and elective courses. The majority of the required courses are in the concentration, along with some credits coming from a capstone project. Courses are offered in a traditional semester format, and there are three start dates throughout the year. All of the courses in the program are offered entirely online. Students who live in North Carolina will receive a sharply discounted tuition rate, while those who live out of state pay 3 times as much in tuition per semester hour. To apply, students must submit undergraduate transcripts showing a GPA of at least 3.0 in upper-level coursework, GRE test scores, a goal statement and 3 letters of reference. To remain in the program, students will need to maintain a 3.0 GPA or higher. Cleary University offers flexible degree options for students, including those interested in studying health care administration. The Master of Business Administration in health care leadership has low entry requirements. Students are not required to provide test scores, nor will they need to have previous professional experience in the field. To earn their MBA in health care leadership, students will need to complete 33 credit hours spread over 11 courses. These courses are offered in accelerated 7-week formats, splitting all 3 of the 15-week terms in half. There is a one-week break between each course. Since many students are working while earning their degree, they aren't expected to study full time. Students that study at Cleary's recommended pace should be able to complete this degree in just under 2 years. All courses are available entirely online, although students can complete some of their education on campus if they choose to. Each course also has a low student to faculty ratio, so students can get a personalized education even though they're studying online. There are multiple start dates throughout the year for the MBA in health care leadership. Regardless of when they begin studying, students will be placed in a cohort. The cohort system groups students together throughout the duration of the program. The cost of the program is the same for all students, regardless of where they live. Designed by veterans for non-traditional students, National University takes a unique approach to education. It has placed a large emphasis on its online education where over 90 degrees are available, including the Master of Health Care Administration. This entirely online program prepares students for a position in health care administration at all levels and sectors. The curriculum for the MHA is meant to place an emphasis on the conceptual side of health care administration, while taking a people-centered approach. While some courses will focus on finance and management, students should expect to spend most of their time learning about ethics, management and leadership. National University uses the quarter system for their master's degree, requiring 72 credits to graduate. In total, students will be completing 16 courses, although an additional 4.5 credit course is recommended for students to specialize their education. Of the required courses, one is an internship and the other a capstone project. Both of these are ideal times for students to specialize their education further since no concentrations are available for this program. Students in the MHA program come from different backgrounds. Students don't need any previous experience in health care or management, although many of the students admitted to the program will have some experience. While no minimum GPA is required to be accepted into this program, students will need to submit their GRE scores. The same tuition rate per credit is given to every student, although students should keep in mind that more credits are required for this program than others because it is based off the quarter system. The University of Mississippi offers a Master of Health Informatics and Information Management degree online. This graduate program blends health care information systems with management. Students choose between two tracks: health informatics and health information management. Health informatics is well suited for students interested in the technical aspects of designing and managing health information systems and electronic records. Students interested in health care administration usually choose the health information management track. This track is designed for students interested in managing complex health information systems. Students can use elective courses to specialize their education. If the proper elective courses are taken, students in the Information Management track will also be eligible to become RHIA certified after earning their degree. Doing this will also require spending 80 hours in a health care setting to earn experience, regardless of any prior work experience. To be admitted into UMC's program, students should have a bachelor's degree with a 3.0 GPA or higher. GRE scores are required, although there are no set minimum scores. Prior to being admitted into the program, students will need to have taken a course in human anatomy or physiology. To graduate, students must complete 36 credit hours of coursework, although students interested in RHIA certification will need to complete a total of 41 credit hours. Students should expect to complete this program in about 2 years. Career preparation is important at Bellevue University. Students who complete the Master of Health Care Administration degree can expect to go on to careers as leaders in hospitals, public health agencies, long term care facilities or other healthcare organizations. The MHA is available entirely online, although students can combine online and on-campus studies if they prefer a hybrid format. When students are accepted into the program, they will be included in a cohort. This cohort will last throughout the program, providing a tight-knit team of students with diverse backgrounds and professional goals. A total of 36 credits are required for the MHA. Unlike other MHA programs, Bellevue requires all students to complete 9 specific 4-credit classes. Not all of these courses need to be completed at Bellevue, as the university accepts transfer credits as long as a majority of courses are completed through Bellevue. Students can expect to earn their degree in about 2 years. To be eligible for the program, students will need to have a GPA of 2.5 or higher in the most recent 60 credit hours taken. This can be applied from the student's bachelor's degree. Students must also be working at least half time at a health care organization or get a letter of commitment from a health care organization offering to provide institutional guidance and support during the program and the capstone project. All students will pay the same tuition rate per credit for this program. 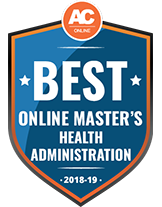 The University of Cincinnati's online Master of Health Administration is designed for working students who are currently employed in a health care role. While this experience isn't required, the curriculum assumes that students have previous experience, so it could be difficult for students new to field to keep up with the program. Even though previous work experience is expected, students can't convert experience into class credit. In total, the master's program is going to take roughly 2 years to complete. This timeline assumes that students are studying part time and are working through their education. Because it is an online program, students can study at their own pace and can even add extra courses on during terms. 40 semester hours are required to graduate, and they're spread over 13 required courses. While there are no official concentrations available for this program, some of the curriculum is structured to provide a specialized approach to the field. The end goal of the program is for current health professionals to advance their current career, so the slight specialization is meant to give students an edge when applying to new jobs. Along with core and concentration courses, students will be required to complete a capstone project. Courses are offered through Blackboard and are accessible at any time. For the MHA, Cincinnati splits its 15 week semester into 2 7.5 terms. Students will able to take 2-3 courses during each of these abbreviated terms. In total, there are 6 terms throughout the year. All of the courses are available entirely online. Online programs at the University of North Texas are geared toward graduate students who are currently working. All online programs are available through Blackboard, and courses can be completed at any time. Available entirely online, the Master of Science in Health Services Administration combines the knowledge necessary to become a health care professional while also offering the chance for specialization. In the program, 2 concentrations are available: applied gerontology and long term care administration. These concentrations are meant for students that are currently working in the field and want to advance their career. Students are not required to earn a concentration, and extra courses will be required for both. Both of these concentrations are in sectors of health care administration that are growing in demand. The length of this MS in health services administration varies depending on whether or not the student chooses to specialize with a concentration. In general, students should expect to complete this program in about 2 years, even if they are working full time. UNT doesn't expect students to have previous work experience in the field prior to applying, although an undergraduate degree related to business is expected. The courses are taught by a combination of business and health care faculty, and students will regularly communicate with faculty while earning their degree. Texas residents will receive a lower tuition rate per credit than out of state students. Any students that are not residents of Texas but are living in the state will pay a higher tuition per credit than residents and out of state students. With 10 specialization options available, the Master of Science in Management from Wilmington University offers diverse routes to careers in leadership. Graduate students can earn their MSM in areas such as health care administration, nonprofit management, management information systems and organizational leadership. All concentrations and core courses are offered fully online, or for students interested in a hybrid approach to education, the same courses can be taken on campus. The 36-credit program is split in half, with 18 credits taken in the student's concentration area and 18 credits of core curriculum. The online MSM courses operate on a rolling 8-week cycle, giving students more freedom to start the program. The accelerated class schedule also helps students complete their degree faster, typically within 12 months. Before enrolling in the program, students must gain acceptance to Wilmington with a bachelor's degree in any field; graduate testing isn't required. After acceptance, students then take a prerequisite management course and must have at least a 3.0 GPA to proceed in the MSM program. Students enrolled in the MSM program are all eligible for the same affordable tuition rate - even across state lines - and can apply for additional financial aid and scholarship programs offered by the university. To help online learners with day-to-day needs, Wilmington University Online provides virtual student support services to distance learners that traditional students find on campus. These resources include online career and academic counseling, tutoring assistance and library access. Professional nurses ready to take on managerial responsibilities and pave the way for a new career can begin by earning a Master of Science in Health Care and Nursing Administration from Southern Illinois University Edwardsville (SIUE). Offered through the university's School of Nursing, the MS in HCNA degree is an online program only open to current registered nurses. To apply to the program, students must have at least 1 year of work experience in the field and hold an accredited Bachelor of Science in Nursing. Additionally, applicants should have at least a 3.0 cumulative GPA reflecting undergraduate studies. At the master's level, students take courses completely online in health policy, health care management, finance and informatics. Students must also complete a 315-hour practicum working alongside established nurse administrators. This practicum experience is not available in all states, so out-of-state applicants should verify eligibility before beginning the program. The HCNA coursework adequately prepares graduates for exams provided by the American Nurses Credentialing Center and American Organization of Nurse Executive Credentialing Center to gain professional credentials in the field. Online graduate students at SIUE don't receive a tuition break or discount compared to traditional campus tuition. To help afford the cost of college, nursing students can apply for a number of scholarship opportunities specific to health care majors as well as those offered by the university at large. The Master of Science in Health Care and Nursing Administration program is accredited by the Commission on Collegiate Nursing Education. The Master of Healthcare Administration (MHA) from Texas Women's University is a hybrid program designed to catapult graduates into professional leadership roles, such as hospital administrator, health care consultant, director of strategic planning and other executive management opportunities. The program combines online and hybrid courses, which require students to attend either the Houston campus or the university's branch education center in McKinley, Texas, for face-to-face course components. The MHA program has 3 potential study tracks: an executive MHA, a regular MHA and an MHA with a business analytics concentration. The executive program is tailored toward students with 3 or more years of experience in management, while the regular track is for beginners. Both options require 45 credits and can be completed in as fast as 2 years. The business analytics specialization track gears graduates toward careers in health care, computer and information systems, and management. This track calls for 54 to 70 credit hours for completion. Available to both on-campus and online students, a career center is offered through TWU to equip students with the tools needed to land employment. Other student services include legal aid and mental health counseling. To gain admittance, applicants to the regular MHA and business analytics tracks must submit their GRE or GMAT scores, and all applicants need a completed bachelor's degree with at least a 3.0 GPA. During the application process, students may be required to interview for acceptance. The MHA degree is accredited by the Commission on Accreditation of Healthcare Management Education. Through Louisiana Tech University's Health Informatics and Information Management (HIIM) Department, students can earn a Master of Health Informatics degree entirely online. This degree is accredited by the Commission on Accreditation for Health Informatics and Information Management Education (CAHIIM) and is the stepping stone to careers in health care environments. Graduates of this 45-credit-hour program find themselves working as coding trainers, data and system analysts, and health information technicians and typically gain employment at specialized hospitals, health clinics and government agencies. The program allows students to maintain full-time employment while they work toward earning their MHI degree. Students can expect to begin new classes 4 times per year and are assigned a personal adviser to help them meet both academic and professional goals. The adviser works within the university's HIIM department, and students virtually meet with their adviser each semester. Students who live within the vicinity of the school, however, are expected to meet their adviser in person. To increase students' awareness and accessibility to events within the health informatics field, the university encourages student membership to the American Health Information Management Association. The minimum qualifications for entering the MHI program include a bachelor's degree from any field with at least a 3.0 GPA. Students should also have at least 2 years of experience working in an area related to health informatics, such as consultation, information technology, law or health care. All online MHI students pay the same rate as traditional graduate students, regardless of residency. Designed as an accelerated program, the Master of Science in Health Care Administration degree at Clarkson College can be completed within 4 to 7 semesters of study. Students can begin the program at 3 different times throughout the year, and the majority of courses are 6 weeks long, with the exception of special elective classes, such as internships and independent studies, which are 12 weeks in length. All courses in the program can be completed completely online. In this course, students put their knowledge and skills to the test and complete experiential service work in local health care agencies. Throughout the program, students examine topics including leadership, health care economics and finances. As a culmination of studies, students complete a 3-credit capstone project to be reviewed. In order to graduate with an MS in Health Care Administration, students are required earn between 39 and 45 credits. Upon graduation, students are ready to enter administrative careers in environments such as mental health facilities, insurance agencies, rehabilitation centers, senior citizen organizations and hospitals. Prospective students must hold a bachelor's degree with a minimum 3.0 GPA in order for admission consideration. While online students pay a tuition rate comparable to traditional campus costs, financial aid opportunities are available, including several scholarships offered to students with proficient academic scores. Online students can benefit from campus services offered online such as assistance navigating the financial aid process, access to class forums and documents, and use of the digital library. The Master of Health and Human Services degree from Youngstown State University blends business practices with health sciences to prepare graduates for administrative and managerial careers within the health care industry. The fully online MHHS program consists of 24 core credit hours earned in management skills and health and human services issues. In addition, 3 specialization tracks are available in health informatics, health promotion and administration for health and human services. No matter which concentration students opt for, they have the choice to complete either a practicum in the field or write a thesis as part of graduation requirements. In total, the program varies between 34 to 37 credits for completion and generally takes 2 years to accomplish. To be accepted into the program, applicants must hold a bachelor's degree and a minimum 2.7 GPA. Students with exceptional academic standing, having a GPA of 3.5 or higher, will automatically receive a scholarship award between $500 and $1,000 per semester for up to 6 semesters. To keep the award, students must maintain a 3.0 GPA throughout their graduate studies and take a minimum of 6 credits. Tuition for online graduate students at YSU is offered at a discounted price; however, out-of-state residents studying online can still expect around 30% higher rates than in-state students. Through YSU's distance learning department, online learners have access to support services including e-tutoring, library and research materials as well as a math center. Youngstown State is accredited by the Higher Learning Commission and is a participant of the Quality Matters program. An online MHA degree program teaches students mandatory skills for managing private health organizations, government agencies and nonprofit organizations. These organizations range from hospitals to nursing homes, health insurance companies and even pharmaceutical companies. What’s the difference between an MHA and an MBA in healthcare management & administration? A master’s in healthcare administration and an MBA in healthcare management & administration both last about two years for students studying full-time. However, an MBA is designed for students who wish to master the business practices that apply to the healthcare field. Often, someone looking to start a health management career from the business side will choose the healthcare management & administration MBA, while a person who has been working in an active healthcare role for years will choose to earn their master’s in healthcare management and administration. MBA degree programs cover information systems, technology, business strategy, management, marketing, economics, finance and accounting as related to healthcare. Meanwhile, an online master’s in healthcare administration degree program focuses specifically on how business relates to health care. Therefore, students cover topics such as scheduling in health care and health care laws. Completing this degree program is ideal for students who would like specialized roles as health care administrators, managed care analysts, health insurance administrators or healthcare consultants. What common courses are offered in an MHA program? Take a look at these five sample courses that are common in any an online MHA degree program. This course introduces students to the legal issues that healthcare administrators face in the modern medical field. Students also learn about the recent legislation and regulations that impact the industry, health care management ethical issues, and both organizational and personal liability. This course introduces students to accounting principles that are used in healthcare settings, ranging from for-profit to nonprofit healthcare organizations. Students learn about cash flow, budgeting and the development of financial statements, among other topics. In this course, students explore how healthcare markets function as well as how economic incentives affect decision-making in the healthcare field. Other topics covered in the course include forecasting expenditures as well as how managed care and the uninsured populace affect the industry. This course prepares students to effectively manage organizational resources, including work descriptions and policies. Students also learn about concepts such as leadership, diversity, teambuilding and employee development. Through this course, students develop an understanding of how U.S. healthcare works in terms of financing, its delivery and its organization. Students learn about how market competition and government regulation affect the nation’s healthcare system, as well as the key issues that face today’s physicians, pharmaceutical companies and healthcare organizations. An online master’s in healthcare administration degree program typically ends with a capstone thesis or course that allows students to show off the skills and knowledge they have acquired through the course. In addition to completing a comprehensive project, students may be required to complete practicums, where they receive hands-on training under experienced healthcare-field professionals at clinics and hospitals. What specializations are available in an MHA program? An online MHA degree program may give students the chance to select an aspect of healthcare management in which to specialize. For example, some students may choose to focus on survey research or child and maternal health. Meanwhile, other students may decide to specialize in environmental health science, health policies, health informatics, medical ethics, long-term care or acute care. Take a look at these other common online MHA degree program specializations below. This specialization provides students with the skills and knowledge they need to help organizations in the healthcare field to run efficiently. Students take courses on subjects such as marketing, finance, patient records and employee management. With this specialization, students explore the methods, concepts and tools associated with the leadership and development of government agencies, private sector organizations and nonprofits in the healthcare industry. The specialization equips them to enhance these organizations’ daily operations and patient care as well as to streamline the systems used to deliver healthcare services. Students who choose this specialization are typically those who already have a strong background in business and healthcare administration. This concentration is ideal for health field professionals who desire to become leaders in today’s medical organizations. An online master’s in healthcare administration degree program will give you the skills you need to succeed in various positions in the multifaceted health field. Take a look at some of them below. These professionals supervise and conduct clinical trials. This involves managing clinical professionals during trial phases and developing progress reports that reflect the findings of the research team. These health field professionals perform research to pinpoint clients’ problems and discover potential solutions. These individuals also draft reports and conduct client meetings to share their solutions. Their clients are typically the managers of a variety of healthcare organizations. Nursing home administrators are responsible for managing nursing home residents and supervising all departments’ operations. A nursing home administrator must understand relevant federal, state and local laws to ensure that his or her facility is in compliance with government quality-related requirements. In the healthcare setting, compliance officers handle issues dealing with compliance with regulations or laws. In addition, these officers ensure that their organizations are current with their licenses. These individuals can work for the companies they service or for contracting companies. In addition to completing an online master’s in healthcare administration degree program, students may benefit from joining professional organizations, which will give them the opportunity to network in the industry. Here are a few key industry organizations that might be worth joining. This association, also known as AHCAP, is a nonprofit organization specifically for healthcare administration professionals. Members of this association enjoy a variety of benefits, such as six complimentary webinars each year and tuition discounts for continuing education. Members can also participate in the association’s yearly conference. This association, which has existed since 1980, exists for the benefit of today’s third-party administrators in medicine and health. Healthcare consultants, insurance providers and audit firms are all members of this association. This association, established in 1968, oversees 30-plus chapters throughout the United States. It hosts an annual conference that nearly 600 exhibitors and members attend. The association also offers five certifications in areas such as compliance, revenue cycle and revenue integrity. Since the healthcare management and administration field covers a wide range of industries, there are a variety of careers available to those with an MHA. The chart below shows the range of salaries currently earned in this field. Students should keep in mind, however, that different industries and positions may require additional training, certification, licensure or experience in addition to a master’s degree. As indicated in the above chart, the healthcare management and administration field will experience high demand for the next decade. This is partly due to the growing aging population, which will demand increasing healthcare and nursing care services over the next several years. Note that there is a difference in salary depending on your degree. The median annual salary for a master’s degree in health/medical administrative services is $80,000, versus $55,000 with a bachelor’s degree. Therefore, earning an online master’s in healthcare administration degree could potentially lead to an additional $25,000 per year. Students earning their master’s degree online should look for a school that is regionally or nationally accredited. Accreditation ensures that colleges and universities are offering quality education. In some situations, it also affects a student’s ability to transfer course credits from or to another institution, as well as his or her eligibility for federal financial aid. Students earning their online master’s in healthcare administration degree should look for colleges accredited by the Commission on the Accreditation of Healthcare Management Education or The Association to Advance Collegiate Schools of Business (AACSB). CAHME is the sole accrediting body recognized for healthcare administration online degree programs. Note, though, that just a few online master’s degrees have earned this special accreditation. Students pursuing an online master’s in healthcare administration degree may need a helping hand when it comes to paying for their programs. In addition to federal loans, scholarships are available for these students. Here are a few options available to master’s students in healthcare management & administration. Many graduate students may be eligible for federal financial aid given through grants and other federal programs. Students should fill out a FASFA form to determine eligibility. Additionally, many employers may cover all or part of the cost of a graduate degree earned toward a relevant career path. This scholarship is available for $3,000, $2,000 and $1,000 each year to three students who can write winning essays on significant issues impacting the current healthcare industry. Graduate students studying healthcare administration can apply as long as their school is a part of the American College of Healthcare Executive Higher Education Network. This scholarship is awarded to minority students enrolled in their final year of a graduate healthcare management program. The scholarship awards up to 15 scholarships annually, and each scholarship is worth $5,000.